PERTH’S #1 MELBOURNE CUP EVENT IS BACK LIKE YOU’VE NEVER EXPERIENCED BEFORE! Rain, hail or shine, we have you covered for Melbourne Cup 2018 as Suited takes on The Camfield. Being the biggest day on our social calendar, we have matched it with the biggest lineup of entertainment yet! ... And not to mention the biggest celebration in Perth for the race that stops the nation. Watch as Suited transform this premium location with 6 bars and 175+ beer taps built for speed as we celebrate racings day of days in style. With air-conditioning, indoor and outdoor zones, this will be the place to be. Doors open from 10:30am with party continuing right through until 1:00am. 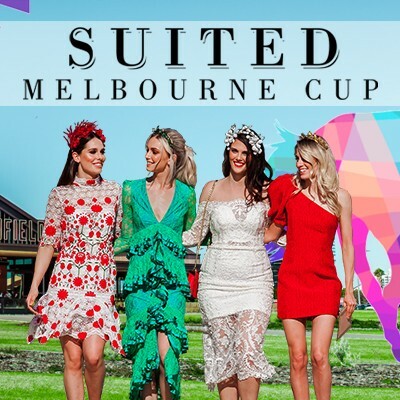 Make sure you stay tuned as we announce Suited Melbourne Cup 2018! Precinct guests will receive a complimentary drink of choice on arrival and indulge in A class service throughout the day with front row seats to all the action. Featuring an 80 metre main bar, luxury outdoor cocktail garden and rooftop lounge to explore, this will be the place to party! Experience Suited Melbourne Cup in style with a premium three course meal, three hour all inclusive beverage package and exclusive entertainment hosted by the luncheon emcee. You will have prime viewing of the race that stops the nation across multiple screens in the venue before joining the rest of the party in the Precinct to celebrate. Suitable for tables of ten only. Home to private lounge areas perfect for group bookings, The Stables will see their guests treated to first class entertainment, all inclusive beverage and substantial canapés package including complimentary oysters, premium bathrooms and the ultimate extreme screen so you can watch every minute live from Flemington throughout the day. Ideal for groups of 30-60 guests. Email info@suitedevents.com.au for more information on the ticketing. We look forward to celebrating another #SuitedMelbourneCup with you all!